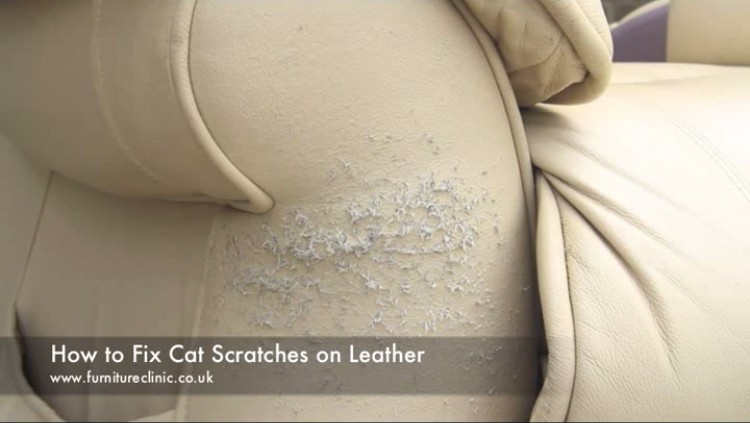 Scuffs and scratches on leather car seats and leather furniture are an all too common problem that can leave an unsightly area of damage on an otherwise perfect piece of leather upholstery. The good news is that using the guide and products shown on this page (all in one kit! 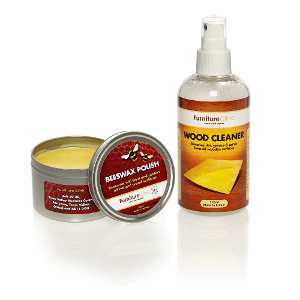 ), getting rid of scratches and scuffs on leather can be quick, easy and easy on the bank balance! See the video guide above and the step by step guide below for details. 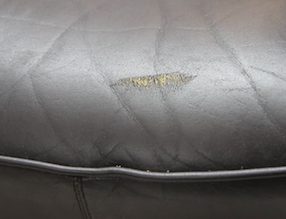 The leather seat shown to the left has suffered a nasty scuff / scratch, leaving an area of damage and colour loss. Despite what is commonly thought, this is a relatively easy problem to fix. With a few simple to use products (available above!) and the steps provided below, scuffs and scratches no longer need to be a nightmare! As with all quality leather repairs and restorations, the first step is to ensure the area is free from dirt and contaminants. 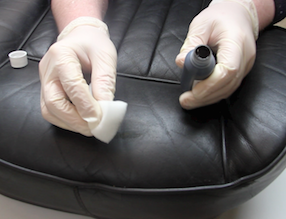 To do this, take the Alcohol Cleaner and apply to a cloth (both included in the Complete Leather Repair Kit) then wipe the area down thoroughly. Once clean, leave the area to dry naturally for approximately 5-10 minutes. The scuff in the example shown was quite rough to the touch, in situations where the damaged area is rough such as this, it is always best to sand the rough areas down. Simply take some 1200 grit sandpaper (included in the kit provided) and gently sand the area until it feels smooth to the touch. This ensures a more professional end result. 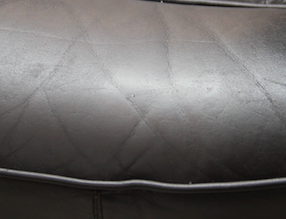 Once the rough areas have been removed, areas of loss to the leather should be filled for the best possible result. Take a small amount of Heavy Filler and smooth over the area of damage using the Spatula provided (Excess can simply be wiped away) and allow to dry (this should take 25-30 minutes naturally, this can be quickened with a hairdryer. 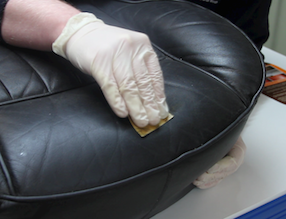 Build the filler up in thin layers as required, using this process, until the it is level with the surface of the leather. This may take one coat, or several, depending on the severity of the damage. 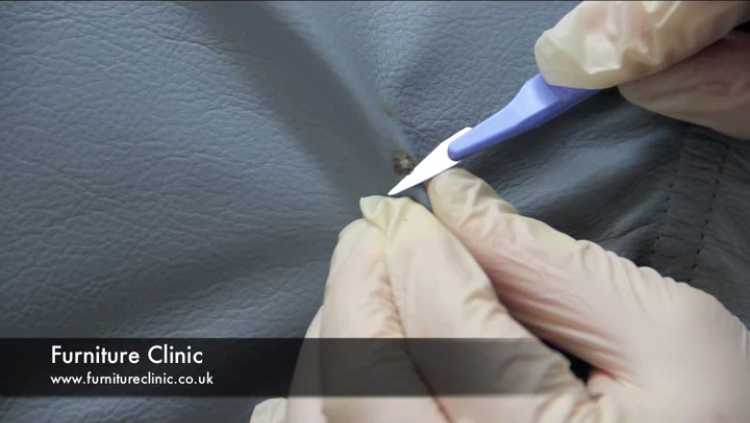 It is always important to leave enough time for the filler to dry completely at this stage, failing to do so will compromise the quality of the repair. 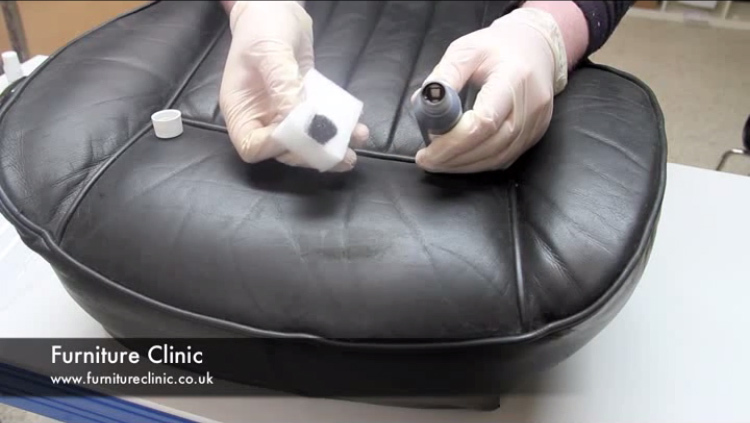 Once the filler has dried sufficiently, the next step is to sand the filler level with the surface of the leather. 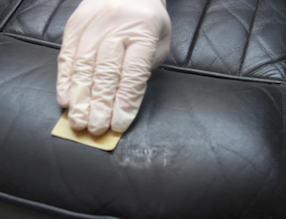 Take the 1200 grit sandpaper used previously and sand the applied filler to ensure that it sits completely level with the surface of the leather. Once a suitable match has been achieved, simply apply a small amount of the matched colourant to the area being repaired, ensuring the entire area is covered. After application, dry with a hair dryer. Use the same method of application and drying to apply as many thin coats as required to completely cover the damage. When done, the colourant will have dried with a fairly glossy finish, do not worry, the required gloss level will be achieved in the next step. In order to achieve the required finish, both gloss and matt finish are provided. Satin Finish (Halfway between) - Mix matt and gloss finish 50/50. Once the finish has been prepared and you are satisfied with the match, simply dab a generous coat of finish onto the entire area being repaired. Once applied, you can leave this to dry naturally or use a hairdyer to speed up the process. Once dry, another coat should be applied using the same process, this will ensure a stronger finish, helping to protect the area from wear, fading and sealing the colour in. 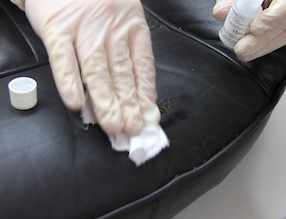 Once applied, if the colourant and finish have been matched correctly, your damaged leather will be almost as good as new! As can be seen from the after image provided to the left; with a couple of easy to use products and a simple process, scuffs and scratches can be repaired quickly and with minimal cost. Professional results are easy to achieve, even for a DIY novice! 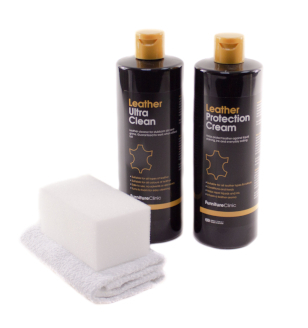 If you have a scuff or a scratch on your leather, purchase the products you need right here at a great price today! Great product! 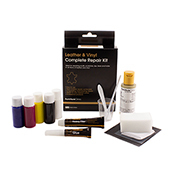 Purchased the leather repair kit for a brown sofa that was badly worn and scuffed. Box came with everything you need and instructions clear. Had a problem with spray gun that would not spray but quickly fixed by cutting off a small length of the tubing that goes into the glass paint pot. As for the results..... amazing, looks as good as new after the repair! If it lasts I will be very happy and will certainly be buying again for additional sofas. really useful video. thank you. where can I purchase the leather repair kit? Hi Barry. Thank you for taking the time to contact us. Please do not hesitate in contacting us if you need any assistance on choosing which products you need for any future projects. 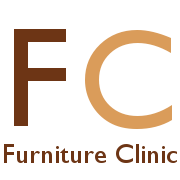 Duncan Ashurst / Senior Sales Advisor Furniture Clinic.